“Bird in Hand” by Simryn Gill. My cat brought me a bird, as cats do. He dropped it outside my bedroom door one morning and made the necessary noise to get me to open it, and when he knew I’d seen his offering he walked away down the hall, not even looking over his shoulder to see if I was impressed. I picked up the bird and put it on my worktable. It would have made more sense to bury the dead creature, or at any rate dispose of it in a decent way. I think I kept it because I felt guilty, culpable, for being the recipient of such a gift. I mentioned the bird when I spoke to my friend that evening on WhatsApp (she’s on the other side of the world from here, diagonally—very north and very west. We speak most days at the end or beginning of mine—the time zones suit her better—and have done for many years, twenty give or take, barring the periods when one of us is for some reason irate with the other—it’s happened, but not often). She said, make a print of it. I asked her, why? Because you’re an artist, she said (she is too—was she being a little facetious? She might have said next: It’s what we do—but left that bit hanging). I put the bird in the fridge (in a zip-lock bag) while I thought about this. The bird was small, almost weightless in the palm of my hand: soft grey body and a yellow head, and white circles around its eyes. As the days passed it began to rot in my imagination. I grew anxious about approaching the fridge. I had put it in one of those special drawers, a bit colder than the rest, for things that need that. My friend’s suggestion started to grow in my head into a challenge, a looming crisis of sorts, in the way that things that you need to attend to, but keep putting off, do. It was becoming no longer an option (as they say) to throw it out; I’d hung onto it for too long to do that. We have a lot of myna birds in our neighbourhood. Often they congregate around the cat’s bowl on the back verandah, an argumentative gaggle, not quite sharing out the morsels, hopping back and forth, some calling from the gutter under the eaves, some perched on the back of chairs or on the table, their Cleopatra eyes flashing, their yellow beaks clack-clacking on the ceramic of the bowl. But it’s the magpies: few in number, large of presence, who head the cat-bowl pecking order. The mynas always give way to these black and white brutes, regal and leisurely in all their moves, with none of the anxious neurosis of the migrant species. Their arrival at the feeding station moves the mynas to complaining from safe distances; and the cat, the long-suffering cat, to crouching behind doorways and under furniture, wide-eyed and cowed, with not much of a pounce about him. The bird in my fridge was neither of these cat-food eaters. I looked on the internet for a visual match and found it was, on the contrary, a type of honeyeater, also called a silvereye, after its bright, white, spectacle frame–like markings, and described as a dainty, nervous native of the South Seas, ranging as far as Tasmania in its seasonal travels. The silvereye is a hoverer: you might see it floating alongside flower blooms, eating the nectar, or flitting from branch to branch in trees. How, I wondered, did the cat, an anxious and permanently bewildered shaggy-coated rescue mog, get his paws on such a lightly flickering target? Had he jumped a myna bird, he would be a hero to some people. Mynas are on many exterminate lists here. They are labelled an invasive species and undesirable aliens. Mostly they’re described as self-evidently bad. Just look around you, the accusers say, and you will notice how raucous and noisy the myna birds are; such pests. And they’re aggressive towards other birds. I hate mynas, I’ve heard quite nice people say. You can find instructions online for ways to catch mynas and kill them (breaking their necks, gassing with carbon dioxide). Some councils give out free traps and guidance on how to do the job humanely. But there is dissent: one senior scientist wrote a piece for the website of the capital’s natural history museum where he said there was not sufficient evidence to support their culling and declared programs of mass trapping and killing of mynas in urban centres is a waste of resources. The doubt expressed is about the science (of what could be declared undesirable, and therefore okay to kill), and about the waste of funds (on irrelevant extermination). Is it possible to think sensibly or coherently in the midst of such opinions, I wonder? And, anyway, whose version of sensible and coherent would that be? In that time while I was vaguely, in the back of my head, agonising over a dead (native) bird killed by my cat, something arrived in the mail, which, if you have that turn of mind, might be called an omen, or at the very least, a procrastination-breaker of sorts. The package held two sheets of gossamer-thin Japanese paper, dispatched from a store in Los Angeles. I’d sent away for samples of these two types of paper out of curiosity. According to the website both are lining papers made for backing scrolls and, to prevent them from shrinking, one has crushed seashell added to it while the other has clay powder. I wanted to know what paper with finely crushed seashell in it felt like, and added the other paper so that I had a similar material to touch, as a comparison. So here were two translucent sheets, needing to be played with in some way, tested, in other words. And there was a bird in my fridge waiting to be printed. Printing directly from an animal may seem like an odd proposition. I read once about missionaries in the South Seas at the end of the nineteenth century making direct prints from large plants. In my mind’s eye, I imagine them, burly bearded men, together turning the trundle of a printing press to squeeze a whole tree between the rollers (I’m sure that’s not how it was done, but this image has endured). They left, among other impressions, a fabulous suite of prints of sections of the coconut palm. I have a small book press, the sort in which a heavy plate is screwed down over a heavy base, to press down a newly bound book. The plates are big enough and small enough to take a bird, but that’s neither a good idea nor what I had in mind. Still, the association of direct prints with printed texts isn’t a new one. Here’s where the Japanese paper comes into its own, although that may be a strange expression, as I use the paper against its grain, as it were, not for what it was made to do. But perhaps coming into its own does make sense when working to the material’s attributes and not its intended function. Most of these papers have the appearance of being delicate and fragile. Many are very fine and light; the two I received in the post could certainly fit that description. But they are, in fact, also incredibly strong, unusually so for paper. They don’t tear or puncture easily, and can take quite a lot of handling, pushing, pulling, wrapping, wetting with this and that, and still hold their structure, and can be smoothed out flat and soft again if placed under weights. I like these papers for their hidden strengths, and especially the very plain ones. I think of them as utterly still, and somehow stern in their toughness; and they have disarmingly receptive surfaces. How to reconcile all these elements? So many broken rules, dislocations, wrong actions, coming together on this single plane. Violence even. A dead bird, killed by a cat out of place (and could the cat’s owner be described in the same way, I often wonder? 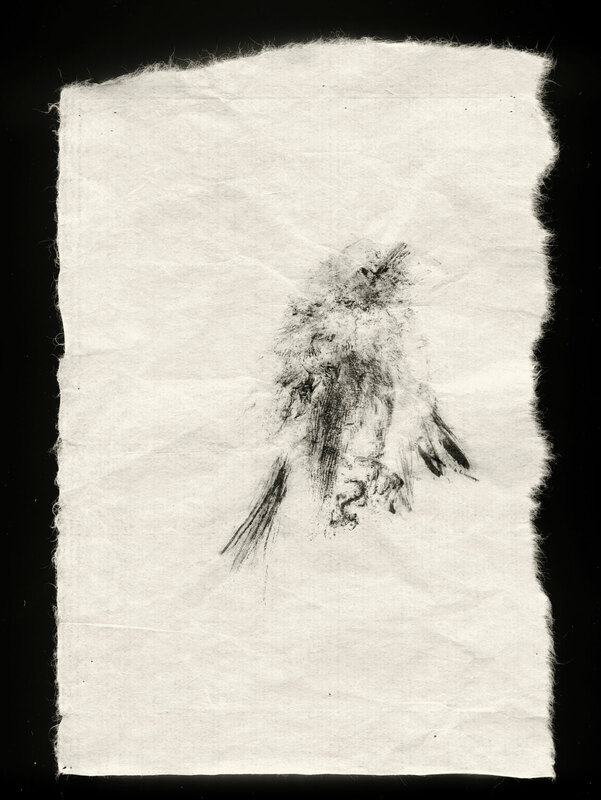 ); the bird’s impression recorded—shroud-like— on someone else’s paper, which was never intended to be a working surface, and which here becomes like an exquisite undergarment worn in public without any covering; the print made with an ink also foreign (French, matter-of-fact, rich and velvety) and used here in an unimagined way, rolled onto feathers and eyes, and a beak. And what of the seashells, pulverised to give the paper structure? I’m told the shoreline along what is now Sydney Harbour held a lot of seashell middens. Those mounds, ancient at their very bottom layers, were excavated and the stuff burnt and crushed to make mortar for the earliest buildings of the new settlement—administrative mansions and prisons, and the more prosaic smaller dwellings. You might say that the first mines here were mines of seashells. You might also say that those mines yielded deposits of deep time, accrued habitation and a profoundly continuous knowledge. However you describe it, the material of the middens became, quite literally, the glue that held the intruders’ new town together. A friend came to visit me from Melbourne a few days ago and we went to Botany Bay to walk—something I do quite often. We overcame our reticence and picked shells in the rockpools exposed by the low tide. I especially love those small, round, not-quite shells—a dome on one side and flat on the other with a perfect spiral etched into the calcium carbonate. These are the trapdoors of turban shells. In a child’s imagination this is the door the animal inside pulls shut when it retreats into its safe private chamber, its complete and enclosed mobile home. I used to pick these on another coast, washed out of a different sea, as a child, and here they were, abundant and pristine on this similarly industrial shore—oddly comforting, with its oil refineries, the gantries and cranes of the container port across the bay, and aeroplanes queuing in the sky to land. Turban shells were a delicacy where I grew up; you hardly see them anymore, at least not on those beaches. I find myself wishing I had kept a few, but I also know that I don’t want to have them to keep, I simply want to know they will continue to be in the sea along with their entire universe. As I circle back to the silvereye honeyeater and the cat, I know I’m in awkward territory, on sticky ground: the milk was spilt a long time ago, as the English would say. They would know, some of us might say, and it stinks. So here we are together, all of us, looking for some kind of ground—inherited or borrowed—to stand on. We’re told life as we know it is slipping away; the coming change might even be an avalanche. The rules that matter may, sooner than we think, be new ones. Over the last few hundred years many places have seen such cataclysms. In one of the stories of devastation, ships appear on the horizon, and in their wake indescribable loss and chaos. This time it’s as if that line is inside each one of us, and the gathered vessels, rather then being a voracious invader, are an inhibition or inability within us. We are the boats and we are the horizon. Is it such a naive idea, a daydream, that we might look to people who are inheritors of those earlier catastrophic collapses in their societies and their lives, to be our guides?